Maintain a healthy glow by removing dead cells from your face and body. Dry, lackluster skin looks and feels bad. It can cause you to shy away from photos and even opt not to wear makeup because it makes the lines and flakiness show more prominently. If you haven’t had a chance to do more than wash your face, you can easily add a new and effective product to your skincare routine. It helps remove toxins from the body so that they don’t manifest into further skin problems. Not all products are created equally. Some skincare exfoliators cause skin conditions to worsen. They contain ingredients such as alcohol which is very drying to the skin. ●	A clearer complexion. An exfoliator removes makeup and dirt which allows your skin to breathe better. The end result is clearer, healthier skin. The texture is smoother and there is less redness because there isn’t as much inflammation as there is when the skin is broke out or irritated. You’ll be pleased to have a product that works so well to treat your problem areas naturally. ●	The need to use less product. You won’t need to use as much cleanser or moisturizer when your skin has been properly exfoliated. Your foundation will go on smoother, too, requiring less to cover your face. That means that the skincare products you do have will last longer which ultimately means you’ll spend less to look your best. You’ll get your money’s worth from Pretty Mommies products because they are high quality and very effective. ●	A healthier lymphatic system. Your lymph nodes flush toxins out of the body resulting in greater health. When stagnant blood pools under the eyes, you see dark circles. 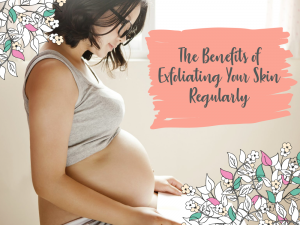 When you’re regularly exfoliating your skin by dry brushing and using products with exfoliants in them, you’re helping increase blood circulation and stimulating the lymphatic system in the process. That way, it can do what it needs to do to remove impurities and waste products from your body. Excess hormones can cause acne and other skin conditions. Treating problems with natural skincare products is ideal as the harsh chemicals in many products further aggravate the skin. Pretty Mommies creates products that are safe for pregnant women and breastfeeding mothers to use daily. See for yourself how much better your skin looks and feels after using our exfoliator. You’ll wonder why you waited so long to gently scrub away your skin issues. Fresh, healthy skin awaits you so you’re always ready to put your best face forward. Pretty Mommies About That Glow Brighten & Refine is the type of product that makes your job easier. When added to your skincare routine, the product gently revitalizes dull, dry skin. The end result is a look that you love because you have a healthy, enviable glow wherever you go. When other women ask about your secret, you can tell them about Pretty Mommies’ complete skincare line.